How do I manage domain announcements? Open the Domain tool from the Main Menu and select Announcements from the tabs bar. Click the New [plus sign] button in the toolbar. Providing a Start date and an End date for the announcement; check the Display indefinitely box if you don't want an end date. Checking the Domain wide box if you want the announcement posted to descendant domains. Completing the body of the message with the rich text editor. The To field in the New Announcement window is automatically populated for you. To delete an announcement, check its box and click Delete. Click Edit in announcement's column to make changes. Click Delete Expired to automatically delete all announcements with expired end dates. To preview an announcement, click its link in the Subject column. Is there a way to list the announcements so that the current announcements is on the top of the list? 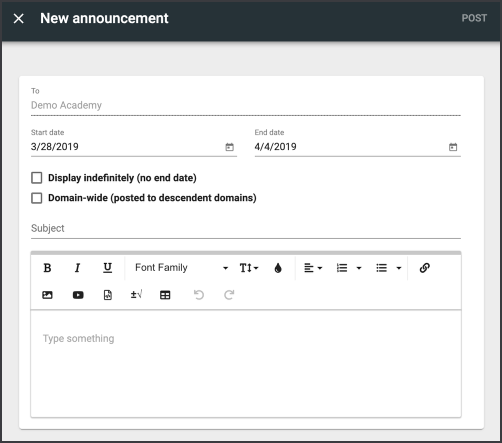 Is there a way to send announcements only to the teachers within a domain and its subdomains?